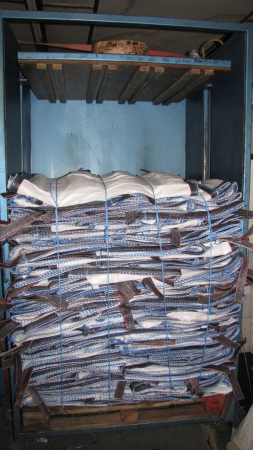 Polypropylene Products manufacture and rework Woven Polypropylene FIBC bulk bags but we have a range of other services available. We have a Palletising machine that ensures your Polypropylene FIBC’s or PVC bags are palletised securely for dispatch. We have a Cold cutting machine used to cut to size woven polypropylene fabric or PVC . This can be cut to 2 metres wide and any length. Out heat cutting machine can cut Woven Polypropylene fabric to a maximum size of 110cm wide. Although our cutting machines can only cut to certain widths , that doesn’t mean your Polypropylene bags , FIBC’s or PVC solutions can’t be bigger than this. We manufacture bulk bags or FIBC bags much larger than this. If you would like your woven Polypropylene bags to be printed , we can print your bags on our Flexographic printer.